My niece and nephew with the contents of their box. Photo credit: Princess Ganuelas. 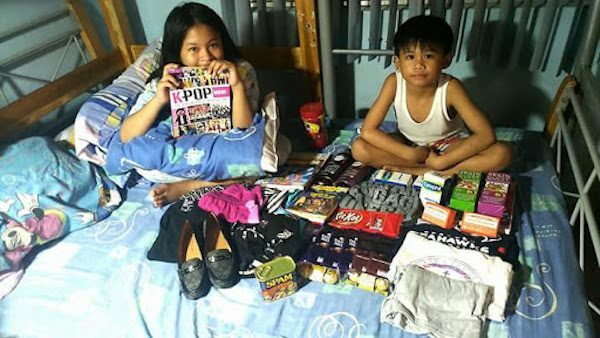 In reality, we can’t all come back home whenever we felt like it, so we miss out on milestones, birthdays, anniversaries—but we can always make up for it by stuffing boxes with kitsch, candies, clothes, shoes, accessories, toiletries and even money. It’s not at all similar to spending time with loved ones but we all know that a magic box of gifts can assuage some of the heart’s craving. This year I set about sending my very own balikbayan box, and this is exactly how much it cost to send one to the Philippines for the holidays. I’ve been talking to my sister-in-law trying to wring information from her on what my nephew and niece would like for Christmas. They’re 7 and 10 years old respectively, and at my niece’s age, I vaguely recall still wanting Barbies and asking for a Barbie’s Dream House that never materialized no matter how much I begged my parents. I haven’t shopped in an actual bookstore in a long time, but it’s good to know there’s still love between us. My 7-year-old nephew competes in academic rigor contests in his school and thus far he’s the reigning champion. My sister-in-law requested books to help him train for these contests. I Googled where to find the books she wanted but found out they’ve been discontinued; Amazon still sells them online so I bought those on Amazon, while I bought the rest from Barnes & Noble. I bought the five-book Percy Jackson series for my other nephew, and some Nancy Drew-esque books and a K-Pop coffee table book for my niece. There will be candy, and there will be chocolates. You really can’t send a balikbayan box without sending American confections. My brother and my dad aren’t too much for gifts, and I normally just send cash to my brother but I thought it would be awkward for him to not have any presents to open, so I bought Seattle Seahawks shirts from the Pro Shop. I also bought Marshalls and Ross shirts for my brother and Dad, plus Cetaphil and Dr. Bronner’s soap for Dad’s sensitive skin issues. He can only get Cetaphil soap through a prescription, so I bought a few bars for him since it’s widely available in America. I almost forgot about my sister-in-law even though we’ve been chatting regularly since I (finally) got on Facebook. I usually just send her chocolates, but—same thing as with my brother—I thought it tacky for her to not receive something, even though she’s not one for gifts either. I wanted to give her Seahawks shirts but seriously, why are the women’s selections so darn terrible? I went to Target and saw discounted but beautiful Seattle shirts and grabbed a few. It’s always difficult to buy presents for my mom because of her Dom Perignon tastes on her retiree’s budget. I’ve tried through the years to buy her exquisite gifts, but she only really likes the ritual of receiving and unwrapping presents, which she then gives away to friends or relatives. It would have been too easy for me just to not get her anything—but that, my friends, will not go over well. I have to give Marshalls more credit on their retail selection. I tend to stick to a few select brands and I very rarely venture out, but I’m glad I went to Marshalls. They even have SK-II skin care products, Estee Lauder, Philosophy, and other brands that would have otherwise dented my budget significantly if I bought them from Nordstrom’s. Later, I bought Mom a book I saw at Fred Meyer’s; she tends to be on Facebook a lot and I thought it would do her some good if she re-discovered her love of reading. My parents have a full-time live-in maid and so I sent a box of candy in appreciation of her hard work. My sister wanted to split the shipping costs of a bigger balikbayan box for $80 but I wanted to send my own and besides, she was procrastinating on getting her shopping done so I went ahead and shipped off my box and just gave her $40 to ship her own. I sent my box to LBC Express in Seattle in late September and I was told that the package would arrive in Metro Manila within three months. My balikbayan box arrived in my mom’s house in less than two months, so my family had an extra early Christmas this year. This piece is part of The Billfold’s Holidays and Money series.